Acetyl-L-Carnitine is a modified amino acid supporting normal cellular energy production and restores function to aging mitochondria to more youthful levels. Acetyl-L-Carnitine is recommended for people with age-related mitochondrial dysfunction. Acetyl-L-Carnitine is a natural compound found in the human body that restores function to aging mitochondria. Dietary acetyl-L-carnitine restores mitochondrial function to more youthful levels and can pass through the blood-brain barrier. Acetyl-L-carnitine has been shown to help with cognitive function, relieve neuropathic pain, treat depression, and has anti-fatigue properties. Serving Size: 1 Vcap® Servings Per Container: 25 Amount per Serving % Daily Value * Percent Daily Values are based on 2,000 calorie diet. † Daily Value not established. 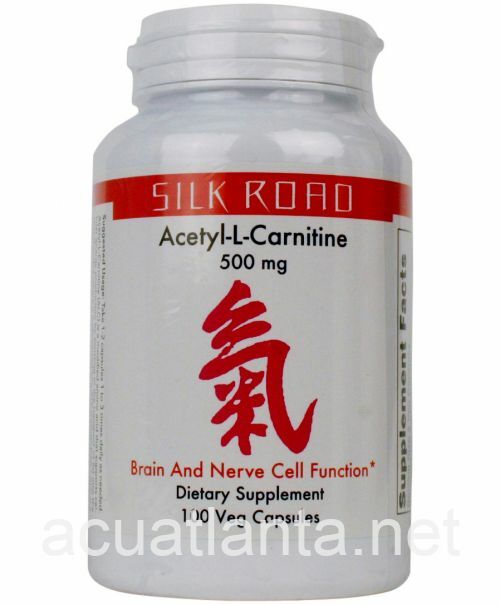 Acetyl-L-Carnitine (from Acetyl-L-Carnitine HCl) 500 mg * Other Ingredients: Cellulose (capsule), Cellulose, Stearic Acid (vegetable source) and Magnesium Stearate (vegetable source). Acetyl-L-Carnitine product is available only from licensed healthcare professionals. Buy Acetyl-L-Carnitine Online here at AcuAtlanta.net or our clinic.